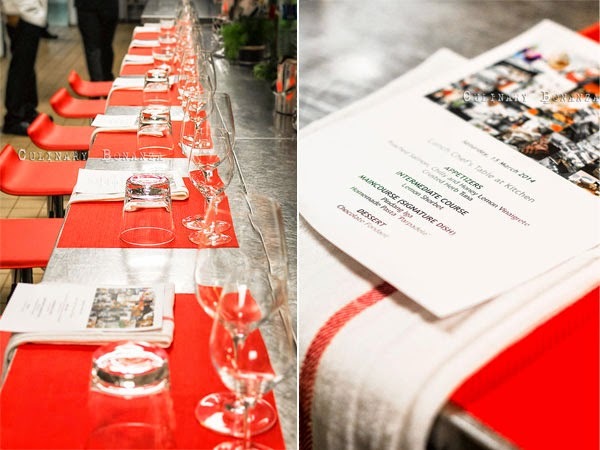 If you are unfamiliar with the term 'chef's table', well, it actually simply means a privilege to dine at the best part of the restaurant, which many believe, is the kitchen. Why so? The kitchen is normally hot, humid, busy, noisy and all sorts of the stereotypes that people normally associate it with. While it is true, but in some cases, a restaurant would have a 'clean kitchen', where customers could sit at within close proximity with the chef who is actually preparing the meal we ordered. The privilege comes in that we get to witness how our food materialize from a variety of items, then plated beautifully into a dish and sometimes, even chat with the chef (for this you have to observe his mood first and read the situation before attempting to break the chef's focus). A number of Chef's Table dining experience that I know of, such as that Chef Will Meyrick has done several times in the past at his outlet Mama San in Bali, or that at Waku Ghin in Singapore. 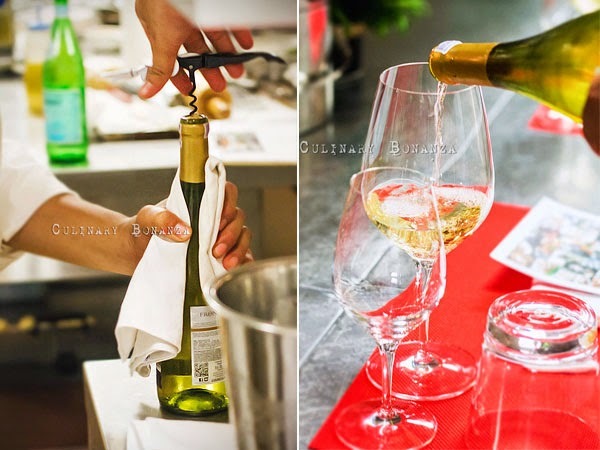 If the price tag per head is too subtle to imply the exclusivity, then the menu should at least shed some clue, since Chef's Table would usually offer not-on-the-menu dishes, ie: dishes that the chefs specially craft to wow the guests. Recently on my trip and staycation at Hilton Bandung, I was so excited to get to try, for the first time (and it was Hilton Bandung's first to host too) the Chef's Table lunch prepared by Executive Chef Rachmat and his awesome team. The Chef's Table lunch was set up inside the banquet kitchen of Hilton Bandung, which is on the second floor. Non-staff are warned to tread their steps carefully because the kitchen floor is quite slippery (except for rubber boots). The 4 course lunch with wine was, undoubtedly, an amazing start of my weekend Hilton Bandung journey. Poached Salmon, Herb Crusted Tuna, Honey Lemon Vinaigrette and Chili - this was one of the best poached salmon and definitely my favourite tuna tataki, yet. 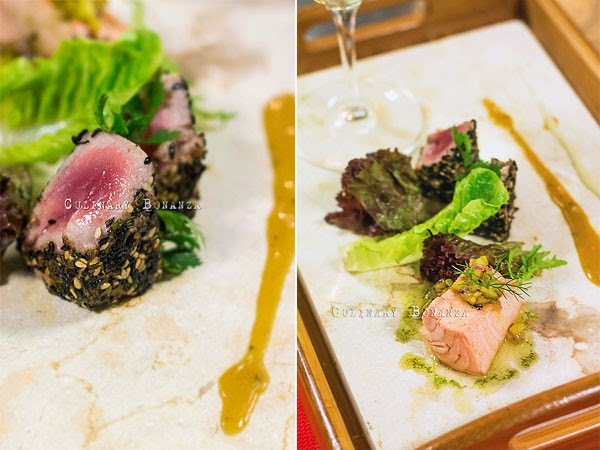 The poached salmon was very tender and juicy, combining well with the sweet and sour bilimbi coulis and the herb-crusted tuna tataki, was just divine. The white wine was a bonus enjoyment but this Appetizer alone was enough to make my tongue danced in bliss. Lemon Sorbet - after the seafood-based appetizer, lime is best to cleanse the palate and prepare for what about to come next. Pindang Iga - beef ribs in hot and sour soup. This dish is boasted as one of Hilton Bandung's signature dish and I could easily understand why it is crowned with the title, just after the first bite. 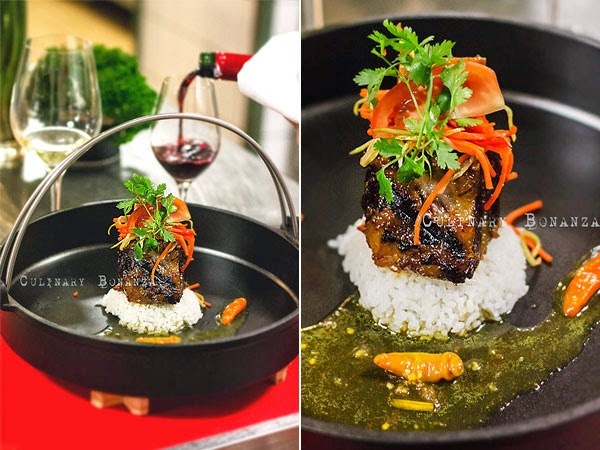 Unlike the usual Pindang Iga, Hilton Bandung's version comes dry, and served on top of jasmine rice. The tender grilled ribs paired so well with the sour and spicy sauce and pickles. Homemade Parpadele with creamy sauce and breaded chicken fillet stuffed with mushrooms. As a part of the Chef's Table experience, one of the chefs showed us how they made the parpadele using the manual pasta maker and these were actually what they served to us. Even with three-quarters full stomach, I could still enjoy the al dente parpadel pasta, so I would not doubt it would taste even better when I'm hungry. Chocolate Fondant with Vanilla Ice Cream. The Chocolate fondant came served in baking paper rolled into an open ended cylinder and to enjoy it, we are supposed to unwrap it. 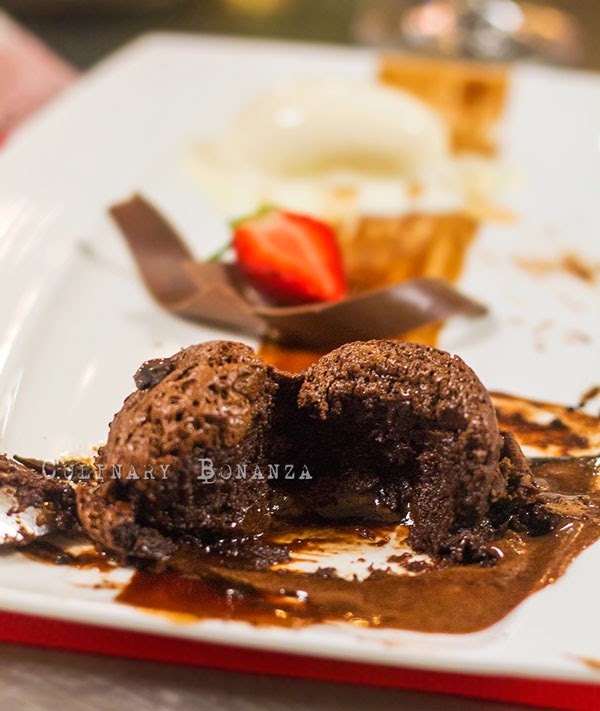 The chocolate fondant, drenched in generous chocolate sauce, tasted nothing like cake as it was a little bit chewy. What a lovely way to end the Chef's Table experience! The only sad news is that currently the Chef's Table is not available for public (yet! Fingers crossed), but I heard it might be ready soon for public bookings. Simply contact the hotel for more details, or if you would like to try one of the dishes above, they might be able to arrange something special for you. Thank you Chef and to your entire team of passionate and talented chefs, keep up the great work!